I am not a fan of Rep. Dana Rohrabacher (R-CA). He is far too cozy with the Russians and Vladimir Putin and I certainly don’t trust him. Not only did he have dealings with the last set of Russian spies kicked out of the United States, he seems to have been chummy with Maria Butina, the Russian woman who is now being indicted on charges of acting as an unregistered foreign agent of Moscow, according to ABC News. Butina actually bragged to classmates that she had worked for the Russian government. Just because Rohrabacher’s a Republican does not make him a good guy in my book. It’s his actions that decide that with me. Rohrabacher’s office has confirmed he met and dined with the then 28 year-old Russian at French eatery Bistro Bis in Washington, D.C., in February of 2017. I find it curious that a high profile politico would find it so inconsequential to dine with a Russian woman that he claims he does not know well. Not to mention why he met with her in the first place. Two years earlier, Butina had helped arrange a meeting in St. Petersburg, Russia that included Rohrabacher and her mentor, Kremlin-connected banker Alexander Torshin, federal officials have confirmed. I’m sure this guy is a hot topic with our alphabet agencies… at least he should be. Word of this meeting comes about a week after Rohrabacher first admitted he met with Butina while visiting Russia with a congressional delegation in August of 2015. Rohrabacher pushed back against its potential significance, saying he was joined by another U.S. lawmaker, along with other Americans. Newsflash… that doesn’t make it okay. It just means others were involved. Rohrabacher is quick to defend Butina calling her arrest ‘stupid’. You know what is stupid? Letting your guard down and letting your organizations be infiltrated by spies. Now, that’s stupid, whether they are Russian, Chinese, Iranian or North Korean. He says the charges against Butina are “bogus.” Right. In my world, if it walks like a spy, it’s a spy. I guess we’ll see. The Department of Justice (DOJ) alleges that Butina was being directed by a “high-level” Russian official as she forged relationships with the NRA and conservative politicians from 2015 to 2017. She had a Russian billionaire oligarch as her handler and she has FSB contacts. Do the math. Either Rohrabacher is a moron and one of the most gullible politicos out there, or he’s complicit. I’m betting on the latter. Rohrabacher’s office confirmed to ABC that he is the unnamed congressman who met with her in the DOJ’s indictment. 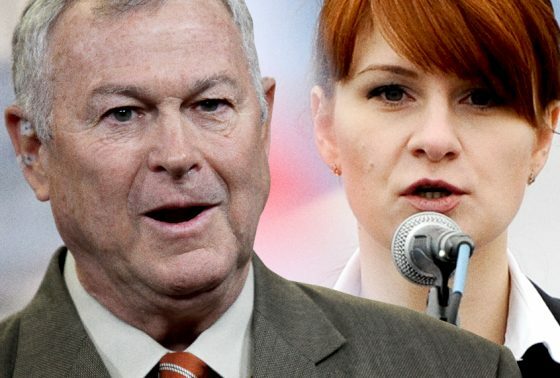 This meeting with Butina is just one more incidence in a growing list of interactions between Rohrabacher and the Russians. This guy was warned by the FBI in 2012 that Russian spies were trying to recruit him as an “agent of influence.” In fact, the Russians even gave him a code name. Rohrabacher’s office is claiming that, as the chairman of the committee overseeing U.S. relations in Eastern Europe, it was necessary for him to meet with contacts from Russia. Possibly, but it also serves as a great cover for espionage if you ask me. “Given any level of Russian activity or interest in relations with the United States, it is not surprising their agents or even their transplanted citizens would be magnetized toward the business of the subcommittee overseeing Russia and its chairman,” Rohrabacher’s spokesman, Kenneth Grubbs, told ABC News. “It is also proper that Chairman Rohrabacher would be guardedly open to their communications.” No, it isn’t and he was far more than passingly known to the Russians. It was old-home week with this guy and the Russkies. Speaking about Rohrabacher’s contacts with Butina, Grubbs said the talks “all came under the normal, fact-finding auspices of the Foreign Affairs Subcommittee on Europe, Eurasia and Emerging Threats.” He’s also traveled to London to meet with Julian Assange, the founder of WikiLeaks, which released emails during the 2016 election that the intelligence community believes were hacked by the Russians. “He’s a very honorable man,” said Rohrabacher, who has reportedly floated a pardon deal for Assange. Again… no. Assange is a tool of the Russians and he is not a good guy. He never has been. I agree with anti-Putin crusader and businessman Bill Browder, who told a room of national security experts gathered in Aspen that he believes Rohrabacher is “on the payroll of Russia.” Browder is an American-born British financier. He is the CEO and co-founder of Hermitage Capital Management, an investment fund that at one time was the largest foreign portfolio investor in Russia. Putin hates him and has tried to get his paws on Browder for years over the Magnitsky Act, to no avail. Putin wants Browder dead. “I believe he is under some type of influence by the Russian government,” Browder said of Rohrabacher. Of course, the Russians call Browder a fraud, which makes me believe him even more. Russia has also repeatedly issued warrants for Browder’s arrest through Interpol, requests known as “red notices,” but the international law enforcement agency has rejected them as politically motivated. The most recent attempt was in May when Spanish police briefly detained Browder before Interpol again rejected the Russian request, saying it was invalid. Other figures connected to the Magnitisky case have died in mysterious circumstances or fallen victim to strange poisonings. Vladimir Kara-Murza, a Russian pro-democracy activist who helped Browder lobby Congress to pass the Magnitsky sanctions, has been almost fatally poisoned twice in two years. Another businessman, Sergey Perepelichniy, who had been a whistleblower in the Magnitsky case, dropped dead suddenly in 2012 under disputed circumstances, again amid questions of possible poisoning. Rohrabacher used information he received directly from the Russian government to promote one of President Vladimir Putin’s top priorities: removing the name of the martyred Russian lawyer Sergei Magnitsky from a global anti-corruption law. Multiple independent investigations blamed Russian officials for the death in jail of Magnitsky, a whistle-blowing attorney who allegedly uncovered evidence of a $230 million theft by officials of the Putin regime. On a trip to Moscow, Rohrabacher met with a close Putin confidant and accepted documents from Russian prosecutors claiming Magnitsky wasn’t a whistleblower, but a thief. Back in Washington, Rohrabacher’s senior aide escorted anti-Magnitsky lobbyists to meet other lawmakers and entered testimony endorsing Russia’s version of events into the official congressional record. Rohrabacher, for his part, says he was merely seeking to find the truth in an international dispute and to avoid gratuitously demonizing Russia. For Rohrabacher, who often boasts about having literally gone to Afghanistan and fought the Soviets alongside the Afghan mujahedeen, the role of pro-Russia congressman is a dramatic change. He was a White House speechwriter for President Ronald Reagan, and in the 1990s he famously arm-wrestled Putin, then a lowly deputy mayor, in a Washington dive bar. Butina collaborated with Paul Erickson, a South Dakota-based conservative who is referenced as “U.S. Person 1” in the charges filed against her. We now know that “U.S. Person 2” is George O’Neill Jr., an heir to the Rockefeller fortune and a conservative opinion writer, from a report today in the WSJ. The Cold War never ended, it morphed and this guy knows it. He’s now in bed with the Russians because he sees it as profitable and politically expedient. Dana Rohrabacher is colloquially known California as “the Congressman From Moscow.” That pretty much says it all.